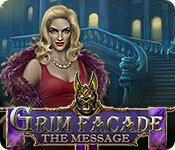 Grim Facade: The Message is rated 3.0 out of 5 by 6. Rated 5 out of 5 by denniann2 from a great game another great game in the series. i don't know why the ratings are so low unless it is because the game was a tad short even for me. it has different levels to choose from and a great hint system. there is also a custom level. it is set up for another sequel. Rated 3 out of 5 by RPgames from Message?? This is a ok game. Murder mystery with some good graphics. Some of the voice actors were ok .Couple though were real bad making some of the James Bond girls Academy winners in comparison. The search for items to help in ones quest was fairly easy . The game did end rather abruptly it seems. A game to use ones free game. Sorry but never got the message part of the games name. I have played other games in this series with this not the best so I was looking for a good game like those but ?? Recommend this game? barely. Rated 3 out of 5 by LikeAGoodStory from Solid and Fun Game for Me I love the diversity in these reviews. Like most, I have my favorite reviewers but sometimes, we disagree. On this day, I enjoyed this game, found the dialogue fun, the pace was okay, and overall, the HOPs were entertaining, with a few exceptions. I'm not a big fan of this series, and this storyline was all over the place, which amused me on this day and may not have on another. Other reviewers have done great job (as always) with the details. My review is based upon completed play of the game. Rated 2 out of 5 by Granny_Gruff from Why Would the Medium Have Locks on the OUTSIDE of Her Door? In a small town, the local medium, Madame Esperance, claims she has been helping to protect the town from evil for years by helping the police. She sent for you to help solve her murder. Her crystal ball is an equal opportunity visionary. You arrive in time to see her murdered thru her window by someone wearing one of those beaked masks that keep showing up in games. After you laboriously work your way through her security system, you are in time to be caught with blood on your hands and tasered by the police. You quickly find yourself in jail. Good News: Some fool will let you out for 24 hours to find evidence in your favor. Bad news: The murderer has a head start on killing other townspeople! Good news: The story is better than several of the previous entries in this series. Bad news: It's still not good! There seems to be some indecision on the part of the Devs to settle on a single time period or even a game style. Worse news: They did agree to use some of the most deadpan VO's I've ever heard. More Bad news: They have you running all over town stealing and waving a Spirit Catcher around when you see a cat! Worst news: The story is finally as big a muddle as the game play and left me wanting to escape Mordamo. Perhaps it is time to lay this series to rest, now that its been beaten down so thoroughly. Please try the Demo before you buy. Rated 1 out of 5 by pennmom36 from JUST WHEN YOU THINK THIS GAME COULDN'T POSSIBLY GET ANY BETTER THAN IT ALREADY IS, YOU WAKE UP! I have played the Demo for both the Collector's Edition, and the Standard Edition of this game, and I feel like I should earn an Achievement for being able to endure it! Normally, I play the CE demo when it's released, wait for a really good sale to buy it, then play the SE demo version when it comes out, to refresh my memory, and finally go back to the CE version I purchased, to finish up the game. I did buy this game during a BOGO sale, and I tried really hard, to continue the adventure today, but I failed miserably. I had the entire day off, so I had no excuses, other than the fact that the game nosedives after the demo, and did a poor job of drawing me into the plot. Because I didn't complete the game, I can't really comment on the game in its entirety, in all fairness, this game may have picked up speed in the final couple of chapters. You should probably refer to my friend, skullfun's review, because that review is based upon the completed game. Here's a recap of my review to help you decide which version, if either, is right for you: Either I'm experiencing Deja-vu or this story is hauntingly familiar, and nowhere near as good either! The Message is loud and clear, Madame Esperance (that's way too long of a name, let's just call her Madame E) is a physic medium who foresees the future, even her own! Unfortunately, things aren't looking too good for Madame E, but at least her vision will buy her some time to contact a detective, to get the ball rolling on her own pre-murder investigation. Once again, I play the role of a Detective, and apparently I'm not very good at it, because I never have a single penny to my name. To make matters worse, I have to resort to thieving coins in order to buy objects from shady vendors. I never get a receipt so I'm assuming these are stolen goods, which is surely another reason I'm not a very good detective. As with most of these games, you get to choose your profile picture avatar. There are 3 different male characters and 3 different female characters to choose from. Basically a brunette, blonde and red haired detective available for either male or female avatar. Another unfortunate scenario in my detective career, I once again get equipped with a Spirit Collector. I don't want to talk about it, seriously disappointed, nuff said! Amax Interactive is definitely digging their claws into these older series games, as they desperately try to revitalize these long time standing series' they inherited from ERS. Each game they release lately, are ever so slightly better, (by better I mean better than the last game, not a good game that gets even better) it's clear to see they are putting forth great effort, (gotta give 'em kudos for not abandoning the sinking ship right?) but in the process, they seem to have lost sight of what a Collector's Edition is all about. I expect more collectibles in a CE, not less, and they've never even attempted to add Morphing Objects or any new features, why? Besides looting coins, the only collectibles offered in the Collector's Edition version, are a handful of Madame E's personal belongings! I remember filling out a BF survey a while back that was intended to provide insight from game buyers, as to what they desired within a CE. Did they receive hundreds and hundreds of requests to remove CE bling? 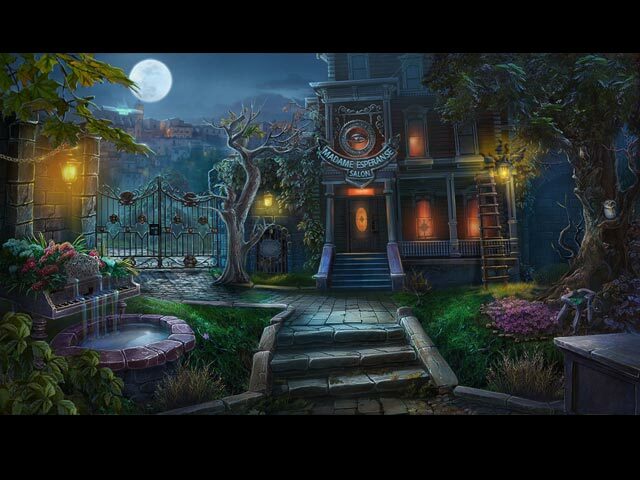 The Hidden Object Scenes are in typical form by this dev, but fortunately, they have called for a cease fire, on doubling up HOP's in repeated locations. 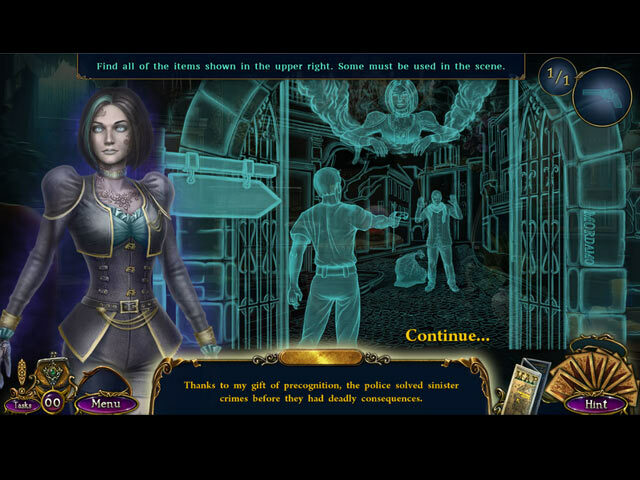 There are Interactive List finds, but most of the Hidden Object Scenes are in the form of Keywords in a sentence, which is a very popular way devs use to incorporate more details of the plot. When I say popular, I mean that almost all of the devs use this method, which is why I loved the method used in Phantasmat, of telling the story through unexplained "visions" which is so much more realistic and far creepier. There aren't any alternative puzzles to opt for, but there are some HOP's that have a small puzzle of some kind to solve. The Mini Games are just okay, neither good nor bad. Most of the games are available in a Casual or Hard difficulty mode. Below are brief descriptions of some of the games you'll encounter during the demo: 1) Move the dial hands so they land on their matching symbols, by selecting a dial and swapping icons to a highlighted slot. 2) Several mini games that require you to click buttons, piano keys etc. in a specific order by trial and error. 3) Move the inner lock pieces so they fit in the outer lock pieces by swapping one key piece from each side. 4) Use directional arrows to guide the ball through the labyrinth to the hole. 5) Assemble the dream-catcher by attaching the string and hanging feathers. 6) Make matches of at least 3 identical tiles by swapping adjacent tiles, in a Match 3 game to collect 12 Fists and 12 Shields. 7) Move the ropes by selecting and swapping 2 rings making sure none of them intersect. 8) Use a map to navigate through the tunnels. 9) Use a magnet to drag a pin through the paths without going outside of the lines. 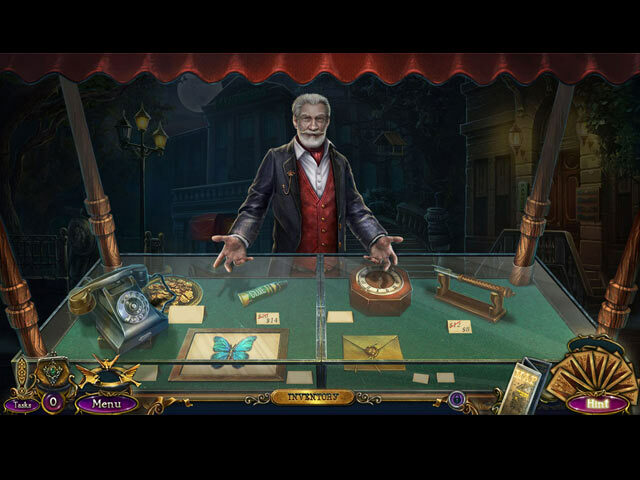 GRIM FACADE GAMES AVAILABLE Title***Collector's Edition Release Date***Average Rating 1-Mystery of Venice (June 2011) 4.2 2-Sinister Obsession (July 5-12) 4.1 3-Cost of Jealousy (February 28-13) 4.0 4-A Wealth of Betrayal (April 24-14) 3.2 5-The Artist and the Pretender (September 18-14) 3.6 6-Hidden Sins (June 18-15) 4.2 7-Monster in Disguise (May 19-16) 4.0 8-The Red Cat (October 22-16) 3.8 9-A Deadly Dowry (September 23-17) 3.2 10-The Message (December 28-2017) 3.4 by: Amax Interactive The Collector's Edition version has 6 Wallpapers, 6 Concept Art pictures, 6 Screensavers, 4 Music Soundtracks, 11 Movie Videos, 16 re-playable Mini Games and Hidden Object Scenes, 20 Achievements to earn (one of which is to skip a mini game?) 7 Collectible Madame E personal items, collectible looted Coins, a built in Strategy Guide and a Bonus Chapter. Good Luck!